The patient is a 43-year-old woman who seeks medical attention for facial asymmetry. She noticed the left side of her mouth drooping approximately one month ago. Incidentally, she describes a lump in her left cheek directly in front of her ear. According to the patient, she first noticed the lump approximately 3 months previously. It has grown steadily since. On physical examination, there is a firm, immobile lesion in the left parotid gland. Fine needle aspiration is interpreted as a malignant salivary gland neoplasm consistent with acinic cell carcinoma. The resected specimen shows a 1.6 cm circumscribed tumor. 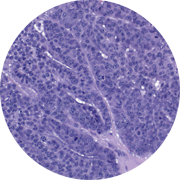 Histologically, the tumor consists of sheets, nodules, and ribbons of malignant cells. The cells are large and polygonal with abundant lightly basophilic, granular cytoplasm. The nuclei are round, uniform, and slightly eccentric. The chromatin is vesicular and generally there is a single, central, prominent nucleolus. Apoptotic and mitotic figures are readily apparent. A diagnosis of acinic cell carcinoma is made.